Quantity Discount Price shown is per . 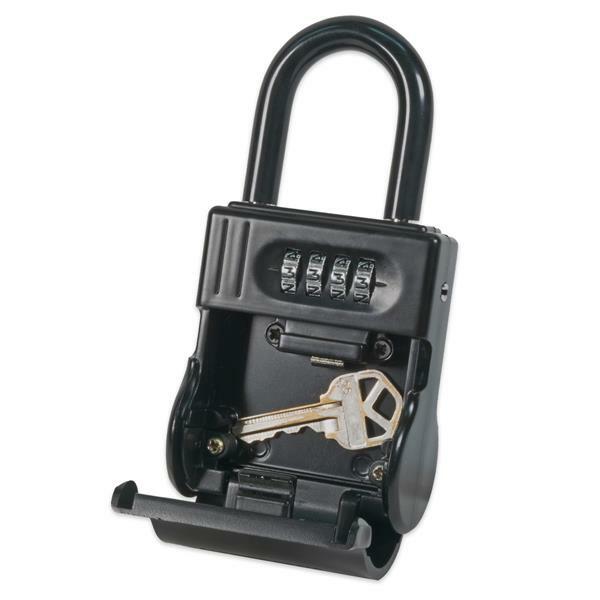 for the shackle-- and the combinations can be changed in seconds. It’s all metal construction and hardened steel shackle make is the safest, most secure key storage solution on the market. The ShurLok fits on any door knob or it can be secured on gates, fences etc. on construction jobs, storing keys to your boat, access for house sitter, etc. Outside: Overall Length with Shackle is 5-7/8" . Box is 3-1/2" tall x 2-3/4" wide and at the thickest point it is 1-1/2" thick. Opening of shackle is 1-3/4" tall and 1-1/4" wide. Inside Compartment is 2-1/4" wide x 1-1/4 tall. It will accomodate 3-4 keys.